Just as a memory refresher, let’s go back to June 2016, when Bill Clinton met with Loretta Lynch on the tarmac in Arizona. What followed was a loud cry about an appearance of impropriety, Lynch insisting the meeting was a non-political chat about grandchildren, etc. and then Lynch made the announcement that she would not recuse herself from the Clinton email investigation, but instead she would rely on FBI director, James Comey’s recommendations. This meeting set in motion the FBI interview of Hillary on a 4th of July weekend. I went back to looking at news reporting after Hillary’s FBI interview and Team Clinton, predictably had given an exclusive interview to Clinton/Dem media SPIN king, Chuck Todd. 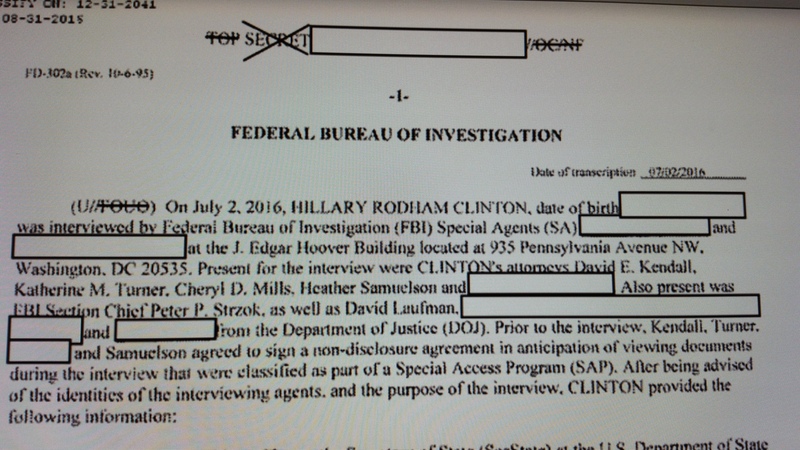 I kept wondering why on earth the FBI redacted only one name of Clinton’s legal team and why on earth would that name be Amy Saharia, when the Clintons released her name to the New York Times in July, so it wasn’t like it was a secret. Then I kept wondering why would Bill Clinton risk that personal meeting with Loretta Lynch on the tarmac in AZ, when if the only thing to iron out was a date and time for Hillary to do a FBI interview. Well, there had to be some details that Bill Clinton wanted to convey personally to a trusted Clinton crony, like Loretta Lynch. I strongly suspect that Bill Clinton arranged for either himself or a another trusted Clinton crony to be present for Hillary’s interview, to make sure nothing went wrong. I’ve always wondered about someone, perhaps like Eric Holder, whom none of the FBI or DOJ officials would dream of questioning or crossing. And I believe that FBI interview of Hillary put James Comey in an even more totally compromised position, but he made his decision to go with the Clinton narrative when he made his statement on July 5, 2016. He spent about 15 minutes chronicling grossly negligent handling of classified information, followed by making up new law and excuses to exonerate Hillary. He decided to go along with the Clinton corruption, probably assuming Hillary would be his next boss. On that same day in July, Hillary Clinton was on Air Force One with President Obama heading to their first joint campaign event. What we don’t know is when those several FBI field office investigations into Clinton Foundation corruption began and when James Comey knew about them. This report would indicate the FBI’s Clinton Foundation investigation was ongoing before the July 2016 FBI interview of Hillary and the FBI was sitting on Bill Clinton’s personal Clinton Foundation server, which Hillary had merged her State Dept emails onto and all those disappearing emails didn’t ring any alarm bells at the highest level of the FBI??? In October 2016, when the leaks started coming out about the Clinton Foundation criminal investigations and the Weiner laptop, Comey and McCabe worked to silence the leaks and COVER-UP for the Clintons. Comey reopened the email investigation strictly as a damage control effort, so he could pronounce a thorough investigation had occurred. He was all-in on covering up for the Clintons. When the DOJ IG investigated the email investigation, Comey hung McCabe out to dry and said he didn’t know anything about McCabe authorizing FBI leaks to do damage control on the leaks coming out of NY about the Clinton Foundation investigations. McCabe said Comey was aware of it and it seems certain Comey knew all about it, because he was helping orchestrate the cover-up and trying to bury the Clinton Foundation investigations, just like he buried the email investigation. Hope your Mom gets well soon – falls are nothing to play around with in elderly people. Thank you LB. That I’m finding out. To the 12:18 & 19 no I hadn’t, thank you and for any further as you may happen upon – maybe a whole new post on this past matter as I expect come January there’ll be another storyline which, I think, will complicate trying to keep the narratives separate and distinct exceedingly troublesome. Historians will come along at some point beyond the two of us and coming up with a ‘roll off the tongue’ way to differentiate the phases but for now it looks to me all the stuff dating back to the 2016 campaign unto now might be generalized as “Bad Judgments/FISC & Malicious Actors/FISA”? In any event I’m not particularly fond of either using the shopworn ‘gate’ to memorialize scandals as ‘gate’ to my mind deserves restriction to things isolated to happening in the near environs of DC. Chapter 1 of current events opening with (for convenience) Bradley Manning to Victoria Nuland’s “Netanyahu is a chickenshit” both pilfered off the homebrew server then in Chapter 2 – US spooks, Russian spooks, Israeli spooks, British spooks, all being more than bit players shows demonstratively At some point the gate was left open, and therefore is no longer useful. “To the 12:18 & 19” Still trying to be sure I understand what this references JK? I am looking at this in much the same way you are , although we still are missing large chunks of “narrative” to fill in how this story rolled along from Chapter 1 to Chapter 2 and also, there’s this whole missing element that no one seems the least bit curious about regards the “Emailgate”. In Oct 2016, a fine time for missing threads to get tugged loose, with those dastardly leakers from NY (or as Cummings, the incoming inquisitor of the House Oversight Committee, referred to them: FBI Trump fanboys, which needed to be silenced), we found out, that indeed, Hillary’s server (REALLY Bill’s Clinton Foundation server) had been hacked by at least 5 foreign intelligence services, we learned about the Hillary emails on Weiner’s laptop, and we learned that the FBI had open criminal investigations, in several states, into Clinton Foundation pay-to-play corruption. What no one ever asks about is what was in ALL those other emails on that server? What was in Bill Clinton’s personal Foundation emails, emails between Hillary/Huma and the Foundation AND most importantly, between the Clintons’ pay-to-play dealings with foreign power players? If FIVE foreign intelligence services hacked that server, they have all of the information that our own FBI, with custody of the Clinton servers (original & upgraded one Huma orchestrated with Bill Clinton IT guy, Cooper), but failed to subpoena or do whatever was legally required for those FBI peeps already investigating the Clinton Foundation to be able to access. WHY did Comey and top FBI officials work to torpedo their own field office criminal investigations into the Clinton Foundation corruption? smear campaign. This Papadopoulos guy’s story isn’t something I’m buying completely, but here’s the thing about him – it does not look far-fetched at all that he was being set-up and that the people setting him up were working in cahoots with some foreign middle-man intel peeps (mostly former intel, it seems), who were colluding with BRENNAN and Dem operatives. The thing that bothers me with this Papadopoulos guy is his savvy, politically assertive wife and her Russian accent, although she insists she’s not Russian. Big question mark in my mind on her. With FIVE foreign intel agencies having hacked that Clinton server, well, that assuredly provided endless ways they can use that info and write action-packed scenarios into the American 2016 Scorched Earth Presidential Efforts, manipulating either side of partisans. The longer this mutual American suicide pact plays out, the better for America’s enemies. I also am curious about the Trump campaign’s efforts to acquire Russian dirt on Hillary. The suicide of Peter Smith, the GOP Hillary email sleuth who was trying to buy Hillary’s emails from Russian hackers story, doesn’t sound right. Then there’s that Russian lawyer who met with Don Jr., which looks like a total set-up that Trump & Don Jr. fell for completely. They are truly idiots and out of their league dealing with the Clinton/Dem scorched earth smear machine and of course the Russians are way more sophisticated than both Trump and the Clinton/Dem operators. Then we have the Brits and Israelis involved for sure. The Israelis are any-mean-necessary players, due to their operating under “existential threat” mode each and every day (that often clouds their judgment imho), but in the American 2016 battle – they would be working to aid Trump over Hillary for sure. The Russians would play both sides against each other, to fuel America’s (in Putin’s words) “political schizophrenia”. Most disturbing – some Brit intel peeps sure look like they decided to actively work with BRENNAN and Dem operatives to torpedo Trump. Sorry for rambling here, it’s more just me thinking out loud here and seeing where you think I’m totally off-base, JK. The timestamps of your above replies LB. With the 12:33 wishing my Mom well. I guess I oughtn’t have combined the three. Just now I’ve got to take care of winterizing business – 19° F early this morning here, I’ll get more into this reply later as tomorrow morning promises to be colder.